It happens each spring. They travel by the thousands, even the tens of thousands. Spurred by sun and warmth, they travel, jacked up on hormones, singularly interested in each other’s bodies. They’re steelhead. Spring steelhead. 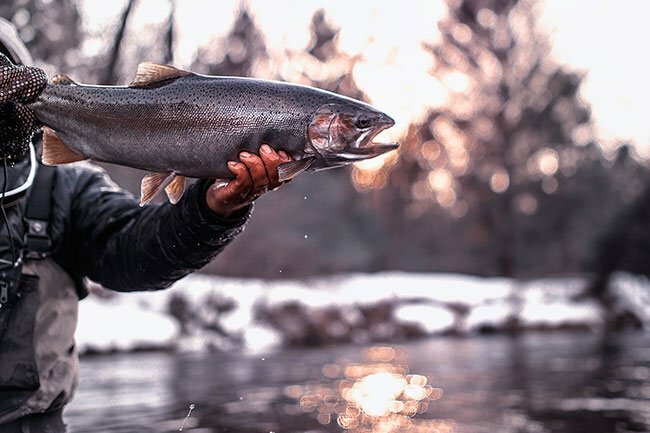 And early in the spring run—in that transitional sweet spot between winter and spring, just as the fishing gets good but before the crowds show up—they can be pretty easy or pretty difficult to catch, depending on the weather and their collective mood. What does that mean? Well, the first thing to remember is that there are two distinct populations of fish–those that have been in the river all winter (the townies) and those that have just arrived (the spring-breakers). They are different fish and should be fished to differently. The townies have been in the river long enough to have seen the preponderance of salmon eggs replaced by nymphs, and they are cued in to those–fish larger hares ears, stoneflies and caddis to them. The spring breakers, on the other hand, are egg-eating fish. Fishing a two-fly rig with a nymph and an egg lets you cater to two hungry audiences at once. Prior to the actual spawn, these two populations also hold in slightly different positions within a given hole or run. Townies have been in the river a long time and have seen their strength deteriorate somewhat. They are usually in those areas of least current—that initial slack water dip at the head of the hole. Spring-breakers tend to hang a bit further back in the hole where the flow is just a little quicker—they’ve got energy and fight to spare. For that reason you might even think of how to sequence your two-fly rig. A nymph dropper ensures your townie food gets down first to where the townies are. Try making your point fly your egg. Spring-breakers are also more likely to move a bit to get their fill. During this transitional period there will be some much colder winter-like days and some much warmer spring-like days. The colder days will see fish return to their winter patterns and holding areas—it may be spring break, but the weather’s terrible and they’re just going to drink in their rooms that night. Taking water temps can be key to parsing the mood of the river that day. And don’t always be fooled by the temperature of the air. Warmer days in areas with serious snowpack will see a good deal of ice-cold runoff. The first part of the day—when there’s sun but not too much melt yet—will see the warmest water temperatures. Once females move up onto the redds they play a huge role in dictating the location of bucks. Pheremones are incredibly powerful things and will draw and keep large numbers of males in the nearest dark holding water. Find the girl, or a redd, and the guys won’t be far behind. In fact, you might think of a redd as the dance floor at Senor Frog’s. The dudes are off to the side, sizing each other up, planning their moves. Sure, there are probably a few off in the corner playing foosball, but you want to focus on the gamers for now. As always this time of year, let the spawners do their thing and watch where you step—there are a couple hundred future tugs and a few dozen future break-offs in each in each egg-blasted redd. And no one wants a future without those.